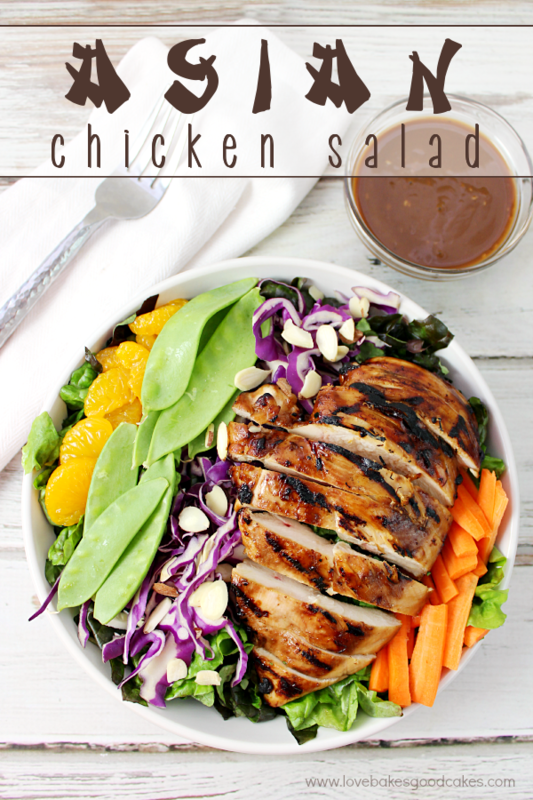 This California Chicken Salad is a quick and healthy dinner idea! 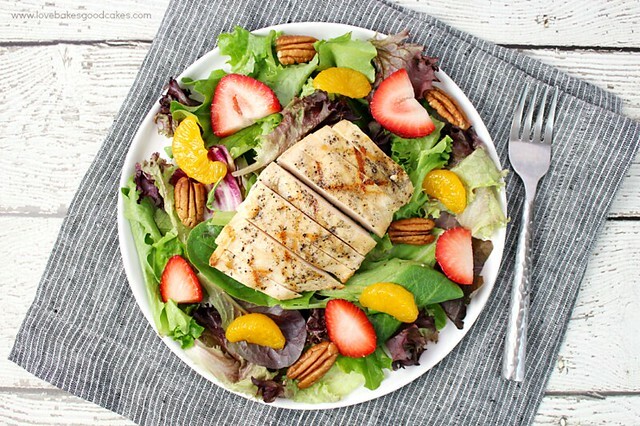 Grilled chicken is served atop a bed of spring mix lettuce and pairs well with juicy strawberries, sweet Mandarin oranges and toasted pecans for crunch! 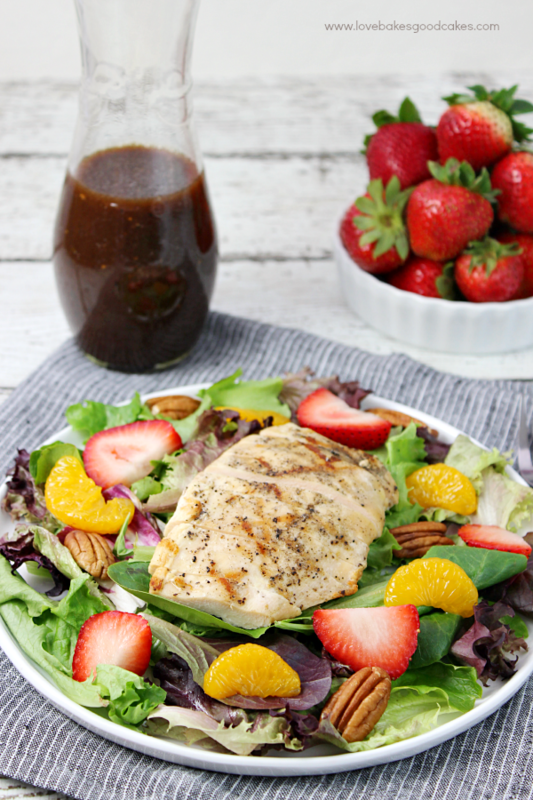 A drizzle of Balsamic Vinaigrette ties it all together! One of my favorite meals in the summer is a fresh salad. 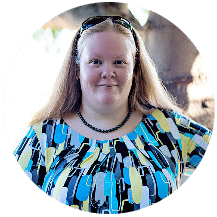 I’m not even picky – I pretty much love them all! For the most part, having salads for dinner helps keep my kitchen cool too, which is always a plus when you have months and months of 100 plus degree weather. I love that the possibilities are endless and salad is one of those things that are easy to customize for each family member! This salad, though …… have mercy! I love the sweetness from the fruits and the crunch of the pecans. 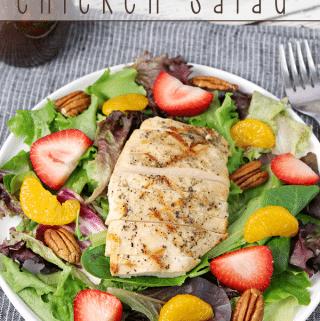 The grilled chicken is one of my family’s favorites and the cool, crisp salad mix … I mean, what is not to love?! This is one salad I could eat and eat and never get tired of. Even my kiddos love this one! Light the grill for two-zone, medium-hot fire. If you have a chicken breast that is really thick on one end, pound it down with a mallet or pot until you get a more uniform thickness for the whole breast. This will allow the chicken to cook more evenly. Rub the chicken breasts with a little olive oil. Season the chicken with salt and pepper. Place the chicken breasts on the hot side of the grate, directly above the coals. Sear the breasts for about three to four minutes per side, turning only once, until golden brown. If the grill flares up, temporarily move the chicken away from the coals. When the breasts are properly browned, move them to the warm, or indirect, side of the grate. Replace the lid and, if using a grill thermometer, bring the temperature up to 350°F. Cook chicken until it reaches an internal temperature reaches 165°F. Insert the tip of a digital meat thermometer into the thickest part of the breast to test. Do not consume raw or undercooked chicken. 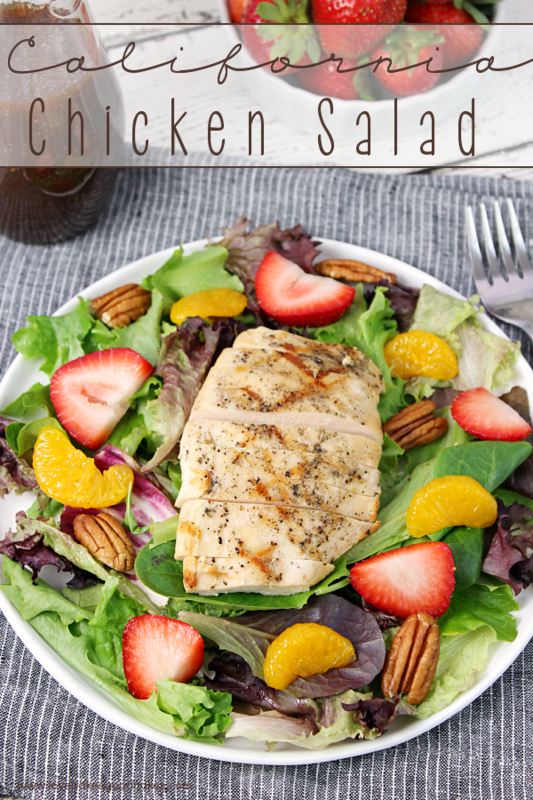 Remove chicken from the grill and place on a plate to rest while you assemble the rest of the salad. Arrange spring mix onto 4 salad plates. 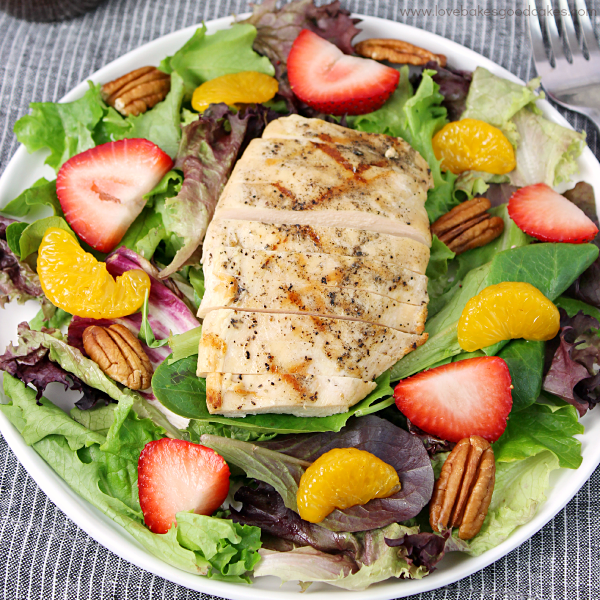 Top with strawberries, Mandarin oranges and pecans. Set aside. Thinly slice the chicken breasts or chop into bite-sized cubes and place on top of salads. 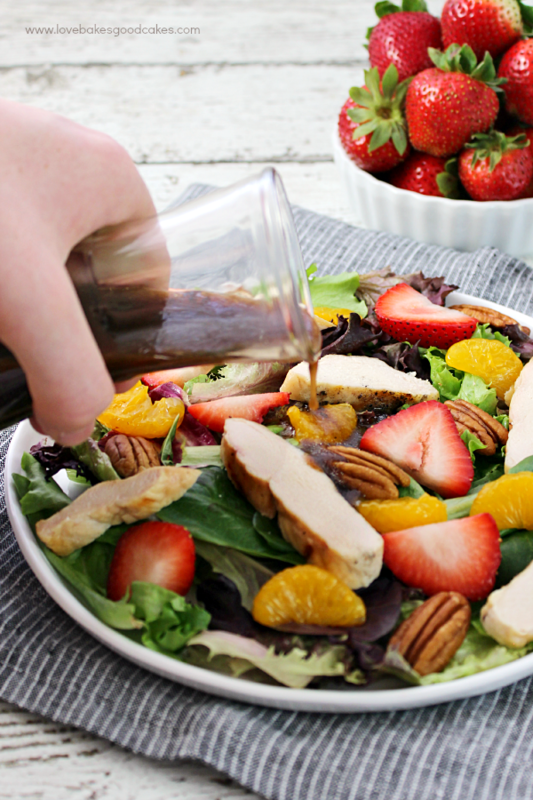 Drizzle each salad with Balsamic Vinaigrette and serve immediately. I shared one of my favorite salads with you. I would love to know what you like to put on your salad! Wow!!! I want one of these for dinner tonight. 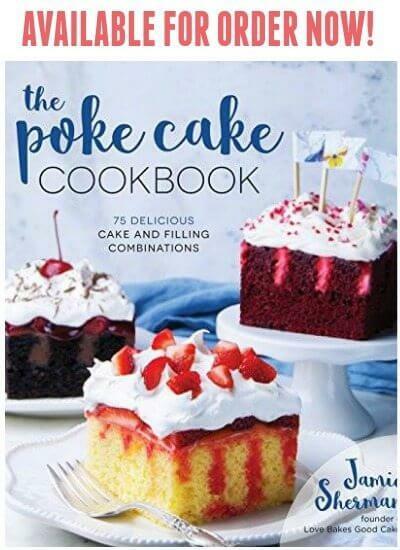 This works so well for my Weight Watcher's plan. I'll just count my points and chow down!! 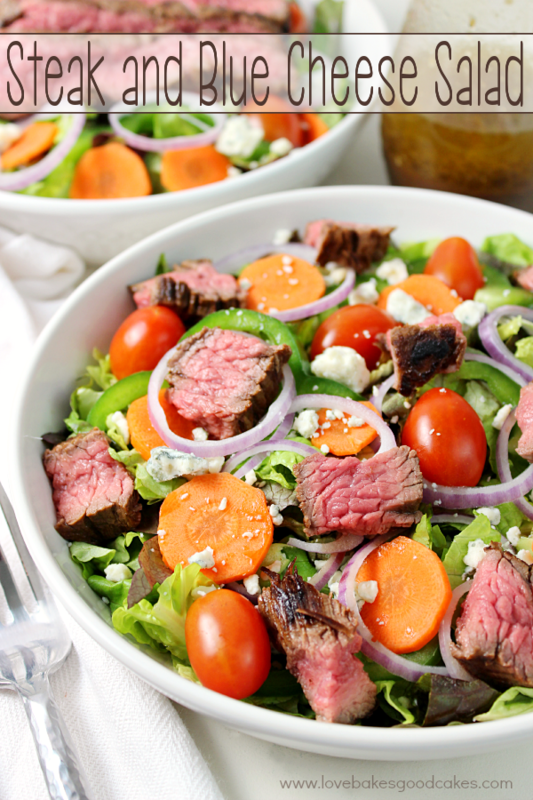 Pinned it … are you sharing these amazing salads at link parties? Don't forget mine!